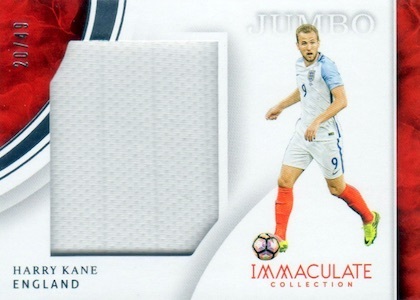 Breaking more into the high-end realm during the 2017-18 season for club and country, the global game is on full display in 2017 Panini Immaculate Collection Soccer. 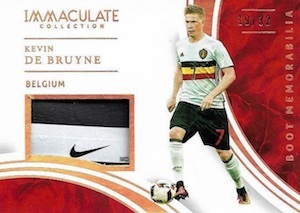 With quality designs and the first on-card autographs for many top-tier players, the Immaculate debut for the sport is packed with talent and very nice relics. Although not quite on the level of the Flawless brand, Immaculate Collection is still among the most premium offerings in Panini's portfolio. In this case, the five hits per box are broken down into two autographs, two relics and one additional hit. There is also one base card to round out the six-card boxes. Speaking of the base set, the 2017 Panini Immaculate Collection Soccer checklist gets started with 100 cards that are each numbered to 99. In addition to the true base cards, a quartet of limited parallels enhance the choices, including Sapphire (#/35), Bronze (#/25), Gold (#/10) and Platinum (1/1). 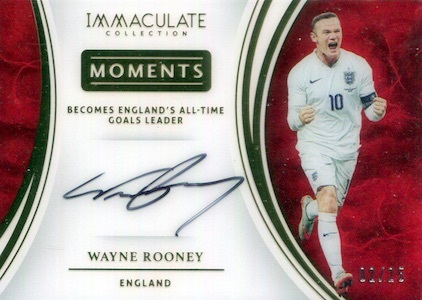 Boasting 12 hard-signed sets, 2017 Panini Immaculate Collection Soccer has no shortage of impressive autographs, which fall at least two per box. 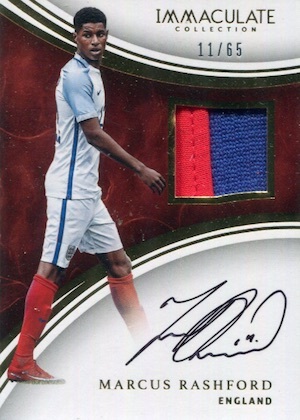 Among the auto relics, the Patch Autograph and Premium Patch Autograph lines include the first on-card autographed patches for Theo Walcott and Christian Pulisic, among others. Also adding in a relic piece, Team Tag Autograph offers specific jersey swatches for the squad noted on the card, while Boot Signatures naturally contains shoe pieces. Also signed on-card, themed inserts include All-Time Greats, Celebration Signatures, Historical Significance, Immaculate Moments, Modern Marks and Shadowbox Signatures. Wayne Rooney and Ryan Giggs are some of the hard-signed debuts here. Promising memorabilia options only found in the brand, the relic cards combine to average 2-3 per box. 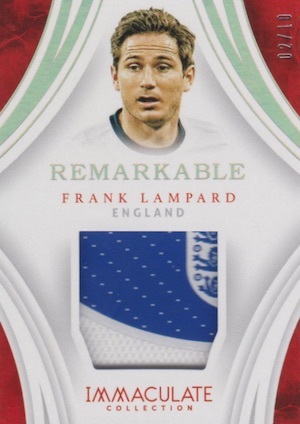 With more than 15 sets available, 2017 Panini Immaculate Collection Soccer features Nameplate Nobility and Team Crests with jumbo patches, while Boot Memorabilia focuses on the cleats. View 2017-18 Immaculate autograph listings on eBay. 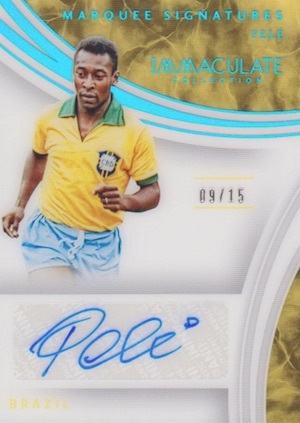 PARALLEL CARDS: Prime #/10 or less (No Douglas Costa, Marcus Rashford*). 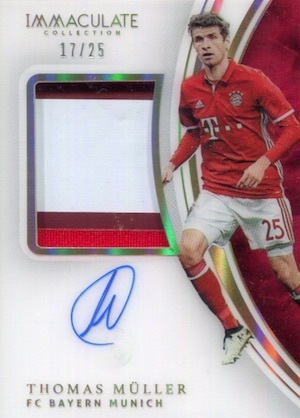 PARALLEL CARDS: Bronze #/15 or less, Gold #/5 or #/3, Platinum 1/1 (No Bale, Hummels)*. All subjects not included in Bronze parallel. View specific options with the spreadsheet. PARALLEL CARDS: Prime #/25 (Neymar #/15, Ronaldo #/7; Martial, Rakitic #/5*), Platinum 1/1. 14 cards. Serial numbered #/2. PARALLEL CARDS: Prime #/25 or less, Platinum 1/1. 23 cards. Shop on eBay. 37 cards. Shop on eBay. PARALLEL CARDS: Blue #/35 (No Aaron Ramsey; Fernando Torres - #/25*), Bronze #/25 or less (No Adam Lallana*), Gold #/10 or less (No Anthony Martial*), Platinum 1/1. 96 cards. Shop on eBay. PARALLEL CARDS: Sapphire #/35 or less (No Elber*), Gold #/10 (No Elber*), Platinum 1/1. PARALLEL CARDS: Gold #/10, Platinum 1/1 (No David Luiz*). 45 cards. Shop on eBay. 43 cards. Shop on eBay. 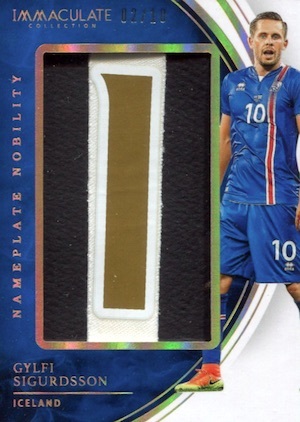 PARALLEL CARDS: Jersey Number #/44 or less, Bronze #/25 or less, Gold #/10, Platinum 1/1 (No Gareth Bale*). 44 cards. Shop on eBay. PARALLEL CARDS: Jersey Number #/44 or less, Bronze #/25 or less, Gold #/10 or #/5, Platinum 1/1. 60 cards. Serial number #/49. PARALLEL CARDS: Blue #/35, Bronze #/25 or less (No Bobby Wood*), Gold #/10 or less, Platinum 1/1. 57 cards. Shop on eBay. 21 cards. Serial numbered 1/1. 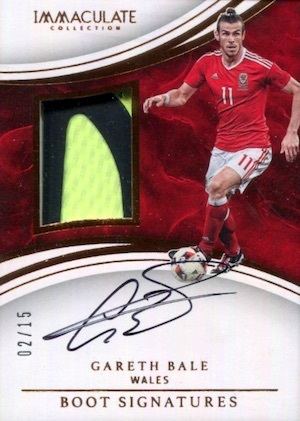 PARALLEL CARDS: Prime #/25 (Lallana - #/10; No Courtois, Szczesny*), Platinum 1/1 (No Szczesny*). 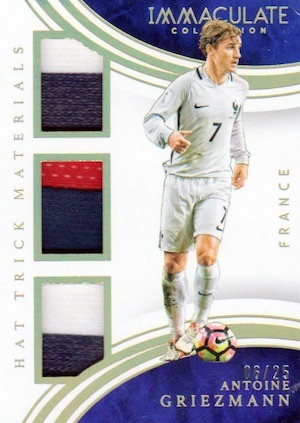 Great product, much better than the usual BS Panini produces.. good mix of vets/stars/young talent. Another poor attempt by Panini to put out a high end product that delivers low quality, damaged cards out of the box. Pulling a Ronaldo Auto should be great, until you see all the chipped edges that makes it worthless to grade!!!! Why can’t these guys deliver undamaged trading cards????? the cards look cool, and of big names. for a high end product, this is a very disappointing launch. looking at the relics, some are match worn, and some are player worn. why cant everything be match worn? 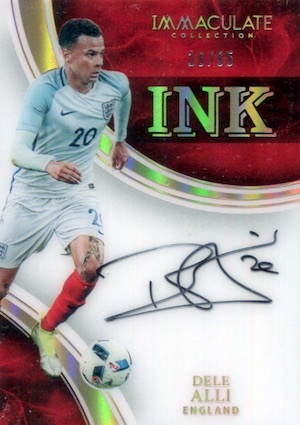 All in all, id stay away from buying boxes of this product, and would just pick up autos and match worn only cards off ebay…. 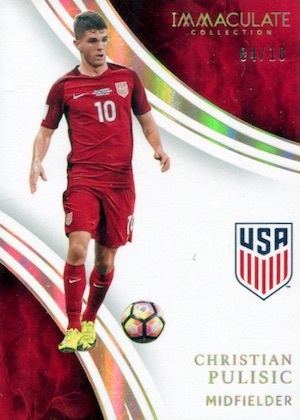 Chris, no one wants graded soccer cards. They are mostly bought by collectors. Thick hard signed cards will always have issues…it is the players that damage the cards a lot of the times before they are even packed. The players do not sell the cards. It’s the manufacturers job to ensure quality. For the price these cards sell for, to deal with inflated, watered down checklists combined with incredibly poor quality craftsmanship, is completely unacceptable. To say thick cards do not typically grade well is an excuse. You pay for quality, you get quality. The only reason thicker cards do not grade well is a lack of Quality Assurance from the manufacturers. It is NOT because they are thick.